​Small businesses in Alpine and the Mountain Empire can find out how the U.S. Small Business Administration (SBA) can help them on Oct. 8 in Descanso! ​The SBA is sending several representatives to the Alpine Mountain Empire Chamber of Commerce “Hot Topics Breakfast” meeting at the Descanso Junction Restaurant, 8306 Highway 79. The monthly Chamber meeting starts at 7:15 a.m.
​“The U.S. Small Business Administration (SBA) and its resource partners will attend the meeting to review programs and resources, and to engage with attendees on small business issues,” said Jamye Pritchett Solorzano, SBA Economic Development Specialist/Admin Officer in San Diego. ​In addition, the Chamber board will announce the organization’s new executive director. ​A hot breakfast, a round of self-introductions, networking and drawing tickets are included in the $20 cost per person. Reservations are recommended. To make one, call (619) 445-2722 or visit www.alpinechamber.com. ​Anyone interested in maintaining Wright’s Field as a wonderful outdoor recreation area in the heart of Alpine can participate in a Trail Workday there this Saturday, Oct. 6! ​Wear outdoor work clothes when you meet the Back Country Land Trust staff at the trailhead. It’s behind Joan MacQueen Middle School at 2001 Tavern Road. ​The volunteer effort will be from 9 a.m. to noon. All volunteer hours may be certified for community service and student school requirements. Call (619) 504-8181 or e–mail backcountrylandtrust@gmail.com if you have questions or to RSVP. ​The delicious aroma of deep pit barbecued beef, pork and turkey will be irresistible on Saturday, Oct. 13, at the Alpine Bert Fuller VFW Post 9578 in Alpine! ​Side dishes, drawings, auctions, prizes and more fun starts at 1 p.m. at the Post at 844 Tavern Road. Enjoy the Rockhounds band from 3-7 p.m.
It’s open to the public and all proceeds will go to veterans’ organizations! ​To get tax-deductible tickets at $15 each in advance, call (619) 445-6040 or go to the VFW Post. Tickets will be $20 at the door. Children 6 and under are free. Please bring your favorite dessert! 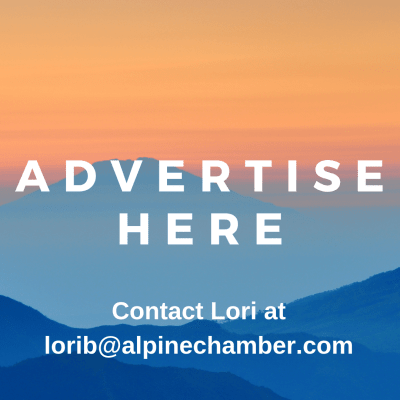 Chamber members who want to see their events in “Chamber Chatter” can call the Chamber office at (619) 445-2722 or e-mail flyers and information to loribledsoe@alpinechamber.com or jom@alpinechamber.com. There’s no charge --- promoting business and organization activities is included in Chamber membership!